Cabrinha Chaos 2016 11 m2 Freestyle komplett gyári bar-ral ! 11 m2 199000 Ft Raktáron! Hibátlan, keveset használt freestyle ernyő, komplett gyári bar-ral ! The 2016 Cabrinha Chaos is designed to win competitions. Surpassing all expectations, the Chaos can handle your training workload and deliver results. Its aggressive, high aspect C-shape design gives you the pop and line slack you need to make unhooked tricks effortlessly. Its superior wind range is a big advantage over its rivals. Extended suspension lines add support to the leading edge to maintain arc shape and add flight stability. This ensures torsional freedom and movement to the kite for a stable and supported ride. Tuned perfectly for freestyle, it flies through turns rather than pivoting through the wing tips. You can throw a kite loop with the tightest arc possible. Its bar pressure stays light but delivers the right amount of feedback to let you know where the kite is at all times. New to the 2016 model are its customizable steering options for either quicker turns, or a more stable kite position for handle passes. The Chaos is designed with performance riding in mind and it needs an experienced hand to get the best out of it. There are a number of ‘modern Cs’ available that have plentiful depower and a user-friendly ride feel; the Chaos can be tuned to offer that to some extent, but it’s really designed for advanced riders kiting at a high level. 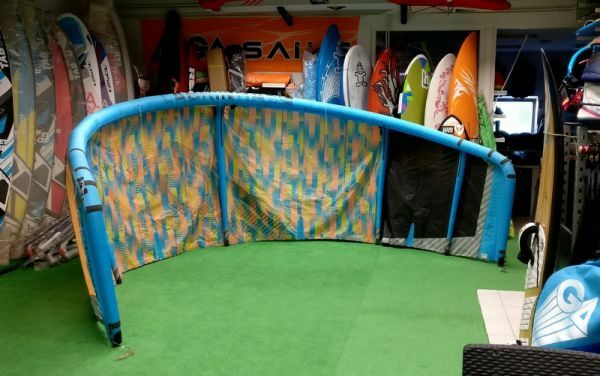 If you’re good enough to unlock its potential you’ll love it but, if you’re looking for a kite for early freestyle progression, then there are other kites in Cab’s range like the FX and the Switchblade which you’ll prefer. Kapcsolódó linkek "Chaos 2016 11 m2 Freestyle komplett gyári bar-ral !" Vásárlói értékelés "Chaos 2016 11 m2 Freestyle komplett gyári bar-ral !"